I recently saw the quote, “I was a latch-key kid and I turned out just fine” and it brought back many memories from my childhood. When I turned nine, my older sister went away to college in upstate New York and was no longer around to watch me after school. At the end of each school day, I would head to the candy store across from my elementary school and buy one of my favorites–either Whoppers, Razzles, or Goldberg Peanut Chews. The crossing guard would then help me safely across the busy street (Rockaway Parkway) that my school was located on and I would walk the remaining four blocks to my home. Once safely inside my house, I would tear into the day’s candy bag while watching my favorite shows, Dukes of Hazzard and Little House on the Prairie. I never felt unsafe or abandoned by my mother and father, who both worked 9-5 to help our family of four stay afloat. Among my close friends, I was the only latch-key kid. All my girlfriends had stay-at-home moms that greeted them each afternoon with a special snack, hug, and help with their homework. I learned to make my own snack, was satisfied with the furry hug and wet slobber of my German Shepard-Collie mix, and worked out each math problem all by myself. None of this really bothered me. In fact, many of my friends enjoyed coming to MY house after school where we could do homework and play without a meddling parent around. So each day, alone or with a friend, I was without an adult until my mother arrived home between 5:30 and 6:00 p.m. It was only during the summer months that I resented the fact that both my parents worked. It was during these months that I wanted to be like everyone else and have my mother around to take me to the town pool or beach where I could meet up with friends and family and enjoy beach picnics and treats from the ice cream man. Instead, I was shipped off, like a boarding school kid, to a day camp located nearly an hour from my house. At first I was quite resistant to going away to camp mainly, because I wanted to spend the summer with my friends. My mother assured me I would make new friends–special “camp friends” that I would get to see every summer when I returned to camp. Returned?!?! I couldn’t believe my mother expected me to go back again the following year!! As usual, my mother was right. I did make wonderfully special “camp friends” that first year. I enjoyed many activities such as swimming, hiking, art, canoeing, and so much more. I even helped lead my camp group to a first place win in the talent show by choreographing the moves to our “Take Me Out to the Ballgame” musical skit. In addition to making new friends, I also discovered a side of myself that had yet to emerge—that of a leader. Among my school friends back home, I had always been more of a follower than a leader. As one of the tallest girls in my grade who also went through quite the ‘awkward stage’ in my pre-teen years, I enjoyed blending in with the pack, rather than standing out. But in camp, my wallflower tendencies melted away in the hot, summer sun. I was not shy and was unafraid to stand out in the crowd…in fact, I kind of liked it! On the last day of camp, we all boarded the bus to go to the movies together. The new comedy, Airplane was playing and we were all excited to see it! As we exited the bus, we eagerly chatted about who would sit next to who, what snacks we would buy at the concession stand, and how happy we were that we would be seeing each other the following summer. Soon, it was my turn and I had to decide whether I would step safely around the dumpster or follow all the campers before me and duck under the arm. At the last second, I made the decision and like all the others before me, I followed their lead and began to duck under the dumpster’s arm. Unfortunately, I did not account for my height and I misjudged my ducking, slamming my forehead into the metal arm with ample force. Within minutes, the bump on my head swelled to the size of an orange! My counselors gave me an ice pack and had me sit in the theater’s lobby, not far from the tasty popcorn and snacks I would no longer be enjoying. All my friends headed into the theater while I waited for my mother to make the long journey to pick me up and take me home. I could hear the sounds of laughter coming from the theater and sat there quietly sobbing from the pain of my injury and the sadness of missing out on our end of camp excursion. So, what have I learned from my nine-year old self? Well, as a latch-key kid, I learned independence, something that is not given freely or at least early in today’s age of helicopter parenting. I have tried to be less coddling with my daughter and have seen her maturity and independence grow in leaps and bounds because of it. In that moment when I had to decide whether to step around the dumpster or follow the other campers under the metal arm, I had the opportunity to not only be smart, but bold and step around the path of ‘followers.’ I could have lead others behind me to do the same but instead, resorted to my follower mentality. For that, life rewarded me with a figurative and literal whack on the head! As I stepped up to that dumpster and prepared to duck under its metal arm, I ignored my inner voice, my personal guru, telling me what action I should take. We all look for answers in our lives…answers that will help guide us to make the best decisions in our personal lives, careers, finances, etc. Many of us have our go-to advisers, those people we look to when we face difficult choices. It’s important to have these people in our lives to give us an outside perspective that we may not see ourselves. However, after listening to this advice, it’s important to keep in mind that—“you are the expert on you” and know what the best choice is deep within your core. 10. Romance and roller coasters…thrill or churro? 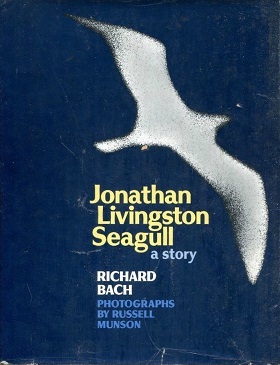 Richard Bach’s work has had a great influence on me starting with one his most famous books, Jonathan Livingston Seagull. This book is my recommendation for this first post. It is a book small in size but so enormous in meaning. Live your life as you see fit. You don’t have to follow the pack and only do what is expected of you but rather you should push your limits and learn what you are capable of doing…even when others do not believe in your potential.